We are pleased to welcome you guys to our Offical April Event! CALL FOR THE SUMMER PARTY!! YAY!! This year, the winter season took too long. But the summer is not far away. Let us welcome summer with you our most beloved Izmir Community Members! 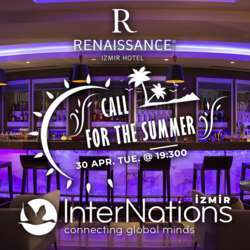 Let's have some drinks and enjoy our networking time at InterNations Izmir @ Renaissance Hotel! We aim to enhance entertainment and acquaintance between the attendees. Please bring your energy and enthusiasm to the event. *Name list will be checked at the entrance by the venue. Unlisted persons will not be taken in or can enter with "Not Signed Up" price. *All attendees is responsible from the personal costs...as only welcome drink is incl. in the ticket cost. *Feel free to bring your international friends, but please invite them to register for InterNations first. Please note: The entrance fees are used to keep the high standard of the InterNations Official Events. They enable us to offer benefits like welcome drinks or special entertainment to our members at popular venues in town. Your entrance fee is used to cover the costs of our InterNations Events and to maintain the quality of our venues. We are a team of volunteers, so ALL benefits go to funding future great events!